Land Values Research Group: Housing: Are we maxed out again? The ABS Eight Capital Cities house-price index for the June quarter of 2014 was released today (12 August). The index has been scaled to per-capita GDP and plotted in red (top curve) in the following graph.† The curve continues to rise, but at a somewhat reduced rate. The last data point does not yet reflect the change in GDP from Q1 to Q2. 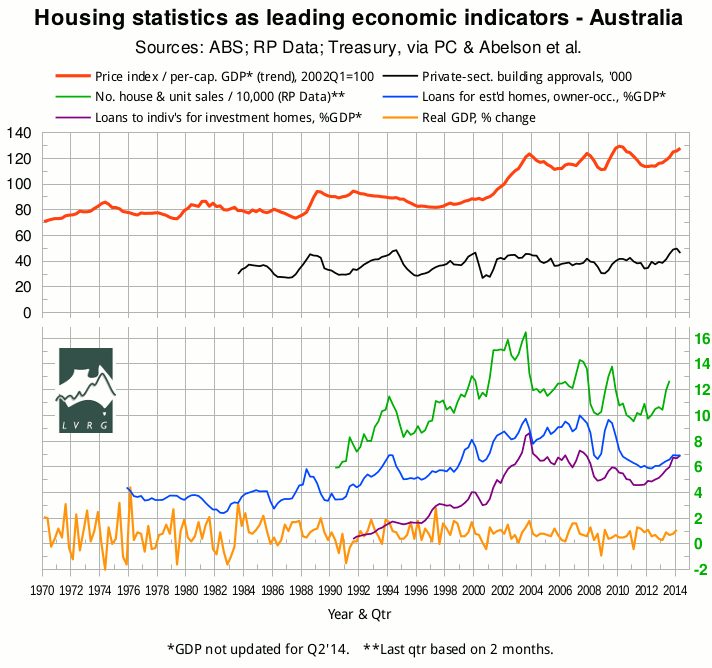 On 8 August, the ABS released housing-finance figures for June 2014 (ABS 5609.0). In the graph, the seasonally-adjusted value of lending for “owner occupation (secured finance) - purchase of other established dwellings”, aggregated quarterly and scaled to seasonally-adjusted GDP, is shown in blue. The seasonally-adjusted value of lending for “investment housing - purchase for rent or resale by individuals”, similarly aggregated and scaled, is shown in purple. The owner-occupation curve has plateaued just above its “GFC” minimum. The investment curve, although its upward trend has been checked, has just peeped above the owner-occupation curve for the first time ever. The closest thing to a precedent was in Q4 of 2003, when lending for owner-occupation had already turned down. Investment lending soon did likewise. The fraction of loans going to first home buyers was then, and is now, historically low. The apparent resistance to the growth in lending coincides with a downturn in the seasonally-adjusted number of private-sector building approvals (black curve, from ABS 8731.0), but does not yet show in the year-on-year housing credit growth as recorded by the RBA (click “Credit Growth by Sector”). Supply-side indicators are mixed. New home sales, according to the HIA, peaked about three months after building approvals; but the number of loan approvals for construction or acquisition of new homes continues to rise. SQM's national rental vacancy rate shows a gradual upward trend with seasonal fluctuation; but SQM's national stock-on-market graph shows little but seasonality. The HIA's median residential lot price, which had been flat, turned upward in mid 2013, and the volume of sales fell. For this, the HIA blames the failure of governments to release land into or within developers' land banks, although the figures actually refer to the release of land by developers, out of their land banks.